You are missing out on the improbability of the transitional changes regardless of the amount of time proposed. You are missing out on the lack of transitional evidence regardless of the time proposed. Of course we know something about the past… we know there were animals in the past that no longer exist today. We know that fossils indicate abrupt appearance of different species, rather than a gradual appearance of new species. We know that there is no evidence of a primordial soup in any ancient rock, when we would expect some, somewhere, in the oldest rocks, if such a primordial soup ever existed. We know that fossils cannot tell us whether animals that were not in the fossil layer existed at the same time as the animals that were turned into fossils. (Absence of fossils is not proof of absence of species.) So we know for certain sure, that we do not know a lot about the past. And we know even less about supposed transitions, because even fossils that look like transitions, may not actually be transitions the way we imagine them to be. And it is certain also, that we know a lot less, based on actual science methods, than we claim to know. You are missing out on the improbability of the transitional changes regardless of the amount of time proposed. I wasn’t talking about improbability. I was talking about getting your facts straight about what the evidence does and does not support. You are missing out on the lack of transitional evidence regardless of the time proposed. I don’t think you’re getting your facts straight about how much transitional evidence actually exists. There is another thread discussing that at the moment. We know that there is no evidence of a primordial soup in any ancient rock, when we would expect some, somewhere, in the oldest rocks, if such a primordial soup ever existed. I don’t think you’re getting your facts straight about that either. Evidence or facts are what we see and measure. The improbability of a certain event is also a fact, and changes how we interpret the facts we observe. And then you cited stromatolites, which come after the primordial soup. You seemed to misunderstand the primordial soup. We have evidence of tiny organisms, but not of the primordial soup required for them to originally spontaneously generate into. 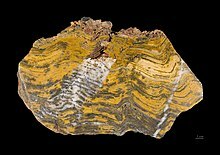 Your example says they were there, but does not indicate how stromatolites generated from inorganic forms, without the aid of ancestors or previous life forms. OK so you’re talking about abiogenesis. That’s fine. But abiogenesis is not common ancestry and it is not the age of the earth. Yes, abiogenesis, the beginning of common ancestry. Without a beginning, there is no process, and no end. It’s not the age of the earth, but probabilities are calculated based on the proposed age of the earth, and then the time required for all the subsequent transitions. Do you have probability calculations for events subsequent to the beginning of life, the single rudimentary cell? Do you think that the probabilities of random mutations, (along with natural selection), would create the vast diversity of life we presently know about, within the time period on earth? Without a beginning, there is no process, and no end. The age of the earth is not proposed. It is measured. But that doesn’t change the fact that there is masses and masses of evidence for common ancestry, and it certainly does not reduce the age of the earth to six thousand years. Yes it does. For everything except for God, it follows. It is proposed. Then measurements are made of various objects, by various methods, that are extrapolated to indicate a potential age for the earth. Age itself cannot be measured, only documented historically. But in this case, like looking at the teeth of a horse, there are only indicators, not direct measurements. Except unlike the teeth of a horse, there are no historical documents to corroborate the methods. So, no probability calculations, in spite of your insistence that an opposing view MUST produce probability calculations? … Masses and masses of evidence is in fact, not a fact, but is merely a generalization which has been made to interpret the facts as observed. If common ancestry is not a fact, then the evidence is misleading, because it cannot be evidence for something that is impossible. It is proposed. Then measurements are made of various objects, by various methods, that are extrapolated to indicate a potential age for the earth. That is not being “proposed.” That is being calculated. Or are you using some new meaning of the word “proposed” of which I was not previously aware? Age itself cannot be measured, only documented historically. But in this case, like looking at the teeth of a horse, there are only indicators, not direct measurements. That is simply not true. Age can be measured indirectly. Indirect measurement is still measurement. If it weren’t, then police radar would be “only indicators, not direct measurements” as well, and you’d be able to make a fortune as an expert witness defending motorists accused of speeding in court. Except unlike the teeth of a horse, there are no historical documents to corroborate the methods. That is simply not true either. When different measurements, whose assumptions are independent of each other, give the same results, that is corroboration. So, no probability calculations, in spite of your insistence that an opposing view MUST produce probability calculations? You’re still conflating the probability of abiogenesis (a subject which is poorly understood) with the age of the earth (a subject which is far, far better established). As for common ancestry, make of it what you like. I’ve decided I’m going to leave it to the biologists to fight that battle. But even if we are completely unrelated to the animals and evolution is “only a theory,” that still won’t take the age of the earth down to six thousand years. The age of earth is proposed. The objects, such as rocks, ice, trees, are observed and measured. The measurements are calculated to an assumed correlation with age, and thus the age is extrapolated. And in fact the age of the earth is proposed first, before some of these measurements are made, and then discoveries are made to determine whether the measurements correlate. sometimes the extrapolations change so that the measurements do correlate, after certain calculations are made. You disagree while you are agreeing… is that your temperament? But the difference between measuring a horse’s tooth, or looking at its color, is that it is an indicator. Radar is an actual measurement. Measuring age is quite different than measuring height, weight, or velocity. You can measure the age of a race with a stopwatch, but… if you don’t know when the stopwatch was started, you have no certainty. When different measurements, whose assumptions are independent of each other, give the same results, that is corroboration. True enough. but when measurements, independant of each other, give different results, will you accept the lack of corroboration? And in fact the age of the earth is proposed first, before some of these measurements are made, and then discoveries are made to determine whether the measurements correlate. sometimes the extrapolations change so that the measurements do correlate, after certain calculations are made. That just tells me that you have no idea how radiometric dating actually works. There is a difference between “doesn’t always work” and “never works”. You are already becoming defensive, and finding your qualifier. Of course there is a difference, but you have not answered the question. If you can draw such a conclusion from my statement, then it is not surprising how you draw ill-considered conclusions from either the statements of others, or even possibly from actual scientific research. You have no grounds on the basis of my statement, so it is telling you nothing of the sort. You simply infer, and impose your assumption on the statement. Not a good scientific, nor scholarly approach. OK I shall rephrase my response. Disagreements and discordant dates account for no more than 5-10% of the data. They usually do not differ by more than a factor of two or three, and often much less than that. They also usually differ for reasons that are well understood. This falls far, far, far, far, far, far short of justifying any claim that radiometric dating could be so out of whack that it consistently fails to distinguish between thousands and billions. I drew such a conclusion from your statement because your statement was simply not true. It amounted to a claim that when talking about the age of the earth, measurement is not measurement. That is simply patent nonsense. It amounted to a claim that when talking about the age of the earth, measurement is not measurement. No, it did not amount to such a claim. The claim was very specific, which you seem to have missed. The claim was that direct measurement of age, is not the same thing as measuring various parts of the earth, or things on the earth. Measuring a person’s heart beat is not the same thing as measuring the person’s age. Measuring the width or length of a person’s toe, is not the same thing as measuring the person’s height, although there may be some correlations. Measuring rainfall for a week is not the same thing as measuring the annual rainfall. Measurement is measurement, but it cannot be forgotten what exactly is being measured. Your statement is patently inaccurate, and patently unfair. If we know trees grow one ring each year in a recognizable pattern, is counting tree rings an accurate measurement of age? We can see with our own eyes the layer of the tree that represents its first year of life. We can directly observe other trees adding one annual ring per year. Would you grant that even if you weren’t there to plant a seedling, you could still correctly measure the age of a tree when it stopped growing by counting its annual rings? No, it did not amount to such a claim. But the difference between measuring a horse’s tooth, or looking at its color, is that it is an indicator. Radar is an actual measurement. I’m sorry, but if that is not saying that measurement is not measurement, then I don’t know what is. Measuring a person’s heart beat is not the same thing as measuring the person’s age. Measuring the width or length of a person’s toe, is not the same thing as measuring the person’s height, although there may be some correlations. Measuring rainfall for a week is not the same thing as measuring the annual rainfall. Measurement is measurement, but it cannot be forgotten what exactly is being measured. Your statement is patently inaccurate, and patently unfair. No John, it is your statement that is inaccurate, because the ages of rock strata are not determined by measuring heartbeats, or big toes, or rainfall, or horses’ teeth. They are determined by measuring, for example, the amounts of uranium and lead in zircon crystals. As you say, it cannot be forgotten what exactly is being measured. Zircon crystals do not contain lead when they first form. None. Zero. Zilch. Nada. Any lead in a zircon crystal must be the result of radioactive decay of uranium. This is not an assumption; it is a fact. The chemical and crystallographic properties of zircons simply do not allow lead to get into them in any other way, neither at their original formation nor through contamination. For lead to get into a zircon by any other route than radioactive decay would have required the laws of chemistry and crystallography and even Euclidean geometry to have been different in the past in ways that would have prevented the zircons from even forming in the first place. We also know how long it takes uranium to decay into lead. Once again, this is not an assumption; it is a fact, based on direct measurement. Furthermore, we know that the decay rates of uranium to lead have not changed because for them to do so would have required the fundamental laws of physics to have varied in the past in ways that would have vaporised the Earth altogether. This means that the ratio of lead to uranium in a zircon crystal gives a measure of the time since it was formed. Sure, you can argue it’s indirect if you like, because you have to run the measurements through an equation or two, but it is no more indirect than the measurements of Doppler shift that take place in a police radar gun. If we know trees grown one ring each year in a recognizable pattern, is counting tree rings an accurate measurement of age? We can see with our own eyes the layer of the tree that represents its first year of life. We can directly observe other trees adding one annual ring per year. Please read if you have time @johnZ. Please re-read the original question: I’m asking the reviewer to specify examples in the materials the reviewer reviewed and found to express “anti-science” sentiment. I should clarify? I did not publish the opinion Ma’am! does not mean anti-science. It means faulty. Even if he is mistaken, and the science is not faulty, does not mean that he is anti-science. Just as saying that some people are bad, does not make one anti-people. It’s frustrating that such a simple concept cannot seem to be understood, Matthew. And it is ingenuous to attack someone’s statement by making a faulty generalization.